Iluna has a modern architectural design featuring either vertical or horizontal elements. 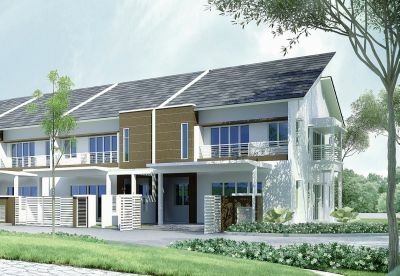 It is the first super-link house development in the Nilai Impian township. GROWTH activity is spreading. And it is spreading fast into the region south of the Klang Valley Nilai. Whether one acknowledges it or not, there is value in Nilai. While prices of landed property within the urban areas of Klang Valley have sky-rocketed, Nilai presents itself as a new place to seek comfortable home-living. And yes, we are talking landed properties here, not small condominiums. 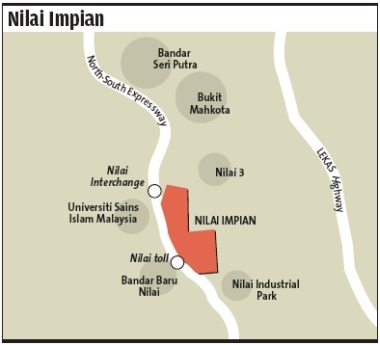 Following the growth corridor's movement towards the south, developments going on at the fringes of Greater KL are picking up pace and Sime Darby Property's (SDP) Nilai Impian. The township development began in 1997, steered by Negara Properties Bhd before it merged with the SDP group three years ago. This development is sited on 1,263 acres freehold land, with 41% reserved for residential developments, 29% commercial and 33% industrial developments. Currently, Nilai Impian is 50% completed with a population of about 5,000 residents. It can accommodate at least 7,000 more people. The township is partially visible from the North-South Expressway and is accessible via major highways like Elite, SILK and Maju Expressway, PLUS Highway via the Nilai Interchange, KL International Airport (KLIA) Link Road and Kajang-Seremban Highway (LEKAS). It is one of 10 townships SDP has under its belt and is about 15km away from KLIA and Putrajaya. SDP head of property Zulkifli Tahmali is positive that things are getting exciting for the township of RM1.4bil gross development value. He points out that Nilai Impian will be in the middle of mature developments and employment centres all around such as KLIA, Putrajaya, Cyberjaya and other townships. Job opportunities would come from industrial developments like Bandar Baru Nilai, Nilai 3, Nilai Square, Nilai Industrial Area and Nilai 3 Industrial Area. Among the education institutions peppered around Nilai Impian are Universiti Sains Islam Malaysia, Nilai University, INTI College, Murni Nursing College, Nilai International School and upcoming boarding school Epsom College. “With the LEKAS highway providing better access, the area will only become more vibrant.This is the beginning to (what we believe will become a popular) area,” he says. Zulkifli likens Nilai Impian's potential to SDP's Bukit Jelutong township in Shah Alam. “When we started Bukit Jelutong, the Guthrie Corridor Expressway was not there. The access just goes to Bukit Jelutong and we had use other roads to get to other areas,,” he says. Nilai Impian will be another Bukit Jelutong in years to come. On why it took 15 years to bring some semblance to the township, Zulkifli says the company has initially focused on the industrial aspect of it. “The project only accelerated three years ago when SDP merged with Negara Properties. Previously it was driven by the industrial estates around it,” he says. Zulkifli says that the purchaser profile for Nilai Impian would be the people from around the area. The township is targeted at owner occupiers, rather than investors looking for capital gains. It will have landed houses, mostly terraces, and mid-rise apartments. Zulkifli notes that there is demand for semi-detached houses and bungalows, which will be developed later on in Nilai Impian. There are five projects launched in Nilai Impian so far Iluna, Davina 2 and 3, Medina and Impian Avenue, all of which had 75% take-up rate compared with the average 50% for areas like this. “The prices (of the property) have not gone up much. Therefore, there are not much investor interest. But I think the area has great potential ,” he says, adding that SDP is the only developer working on a project of this scale in that vicinity. On the big picture front, he says that the company will keep making investments in Nilai Impian even though projects in Klang Valley naturally have higher returns for the group. “We need to develop this kind of places because these are our bread and butter projects,” he adds. “Even if the economy is bad, we're still be there because this is what people would need. He says while SDP is better known as a high-end developer, “that is not all that we do”. “We also do this bread and butter projects. We build these townships and put in the same effort into them as with the higher-end developments elsewhere,” he says, adding that about 70% of SDP's portfolio comprise these developments. However slow the appreciation of the property value in Nilai may be, landed property prices in Nilai have grown from the range of RM250,000 to RM350,000 in 2009 to RM420,000 to RM430,000 now for units with built-ups of between 1,700 sq ft and 2,000 sq ft. While he admits the prices of SDP projects may be slightly higher than other smaller developers, he says that SDP brings amenities to the townships it develops. Among the infrastructures SDP will introduce to Nilai Impian is a highway interchange and other road system to ease accessibility, as well as utilities. “If you're building a township like this, you have to fork out money to build the roads and drainage system. Then only will we look at the parcels of land to build the properties. We will also be enhancing whatever utilities that may already be there,” he says. He adds that there will be a toll gate at the new interchange, within Nilai Impian itself, to enhance accessibility not only to the township but also surrounding areas like Bandar Bukit Raja and Bukit Mahkota, to name a few.